"Le tigre attacks! The Claws! The Gnashing of Teeth!" 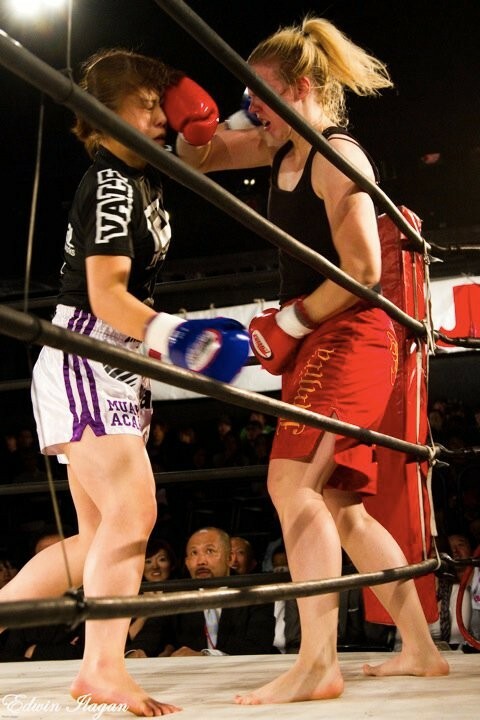 In my other blog I covered my first two professional fights in Japan. However, I had three altogether. And the third and final one left me with a bad taste in my mouth about fighting in Japan. I already didn’t trust the promoters from the experience of my first fight. And I felt like my coach had good intentions for me, but I found that I didn’t follow his way of thinking and sometimes had to go against some of his advice. As I mentioned before, I had been training over the summer for a possible fight in August 2010. I felt great after dropping the 20 pounds and getting a fresh perspective on training from my friend GaijinAss. However, I ended up turning down that fight. It was all too similar to the first fight I had, being another Japanese champion. I got really frustrated about why they kept offering me fights against women who had 10x more experience than me. I tried talking about it with my coach but he seemed to think that there was nothing wrong with it. I started to question my own judgment again, because according to him I should have just been happy to get offered any fights at all. That I shouldn’t worry about winning, and to just look at it as a challenge and for gaining experience. After being offered at least 3 fights that I considered out of my league I was getting angry. Especially since all the Japanese people around me seemed to think that it was a mistake to turn down these fights, though I can understand the point they were making. There are not many women who fight at my weight, and they argued that a fighter shouldn’t worry about experience levels and just wants to fight no matter what. I can agree with that to an extent. But I still stand by my decision to not take a fight against someone who has over 20 fights when I have 2. If they really wanted to help me as a fighter, then they should have worked with me to find opponents at my level so I could get experience and confidence before having to fight champions. I even told my coach that I would drop 15 more pounds to get to the next lower weight class where more women fight. After he called the promoters and told them that, they said I could get many fights at that weight. I started to get excited again, finally some even matches. However, I never got offered even one fight in that weight division. I try to stay away from broad generalizations and stereotypes. But I do believe that there was some Japanese nationalism (on some level) going on that contributed to the types of fights I was being offered. Let’s face it, everybody always roots for the home team to win. Of course that may have just been me being paranoid and had nothing to do with it, but after my experiences I was starting to wonder. I even tried to find my own fights. I found one Japanese woman who had 3 pro fights and was only 10 pounds lighter than me (A weight I could have cut to.) We contacted her gym and asked if they wanted to set up a fight. A couple of days later the answer came in….No. For whatever reason she didn’t want to fight me. So finally, I got offered a fight that was going to be October 17th 2010. The promoters told me that it was against a Japanese woman who didn’t have any professional kickboxing fights. It would be her debut. Of course I accepted this fight. I tried to get more info about her, but they only gave me her first name, which I believe was a nickname, and her weight. I had a feeling that she probably had fighting experience in something else that they weren’t telling me about, but I let it go and just started training. Training for this fight was one of the most difficult times I have had thus far. It seemed like my gym was pushing me extra hard. I was, again, struggling with sparring. I don’t like to complain about training, but I do feel like they took it a bit far this time. There was no technical sparring at all, and for almost a month, every night it was just them pushing me around the ring. One time I almost got knocked out while I was wearing headgear. This kind of training made me feel like I was doing horrible, and I started backing up a lot, just trying to get away from their blows. I almost quit for real this time. I was sitting on the train on the way to the gym and just couldn’t imagine going through that one more day. But once I commit to something, I have a really hard time not finishing it. So I continued. In the states I have a good group of friends from work, school and from the gym. But in Japan, it was much harder making connections with people. Trying to navigate around my dodgy Japanese skills and the social labyrinth that is Japanese society was a 24/7 tough time. And as much as I felt like most of my gym mates liked me, we were never able to connect on a deeper level. Therefore, I really believe that they thought they were making me more tough by pushing me this hard. However looking back, it’s probably part of the reason why I fought the way I did in this last fight. Not common for a Japanese woman at all. We were contracted to fight at 65 kg, same as my other fights. I had still been periodically training with GJS, and I felt my technique had gotten sharper and I had also discovered the true strength in my right punch. So I was feeling good in that aspect. I remember hitting pads backstage before the fight. Everything was on point and powerful. It felt great. I was still nervous, but I always get a little nervous before a fight. I walked out to the ring and saw her standing across from me. The bell rang and we started walking towards each other. Before I could even get one punch in she ambushed me with a flurry of punches. One of which caught me and I had to do a standing 8 count. After that I tried to focus and get back on track but as soon as we started again, it was another flurry of machine gun like straight punches backing me into the corner. I was blocking, trying to throw out some punches and kicks but nothing was connecting. Then all of a sudden I saw the ref wave his hands in the air to stop the fight. He just looked up at me and shrugged. I left the ring and walked backstage and tried to get an understanding of what had just gone wrong. The reason I was so angry is because although I had one 8 count I hadn’t been knocked down and I was still blocking and trying to fight back. I’ve seen fights where even after someone has been knocked down and their eyes are going back and forth, they let the fight continue. So why did they stop MY fight? My coach had no answers for me. I changed and went out and talked to my friends who were watching from the stands, and they agreed that it was pre-mature stoppage. Of course that’s the emotional side of me speaking. If I look at it rationally, I can’t get too angry. The ref was just doing his job and trying to protect me because obviously he thought I was in trouble. After all, I was the one who let her overwhelm me and back me into a corner. I was the one who just stood there, waiting to make my move. All actions I have come to regret to this day. But what was really making me angry was that right before he stopped it I could FEEL her punches losing power. I knew that she was wearing out, and if the fight would have continued I would have gotten a chance to redeem myself. Therefore I felt robbed of that opportunity, and THAT is an infuriating and powerless feeling. Of course I did learn a lot from that fight. Things said to me in training such as, ”Be first” and ”Don’t stand still” really resonated with me afterwards and I took these lessons to heart when I started training again. I really wanted to rematch her before I left Japan but I never got the chance. I told my coach that I would like to have at least one buffer fight in between our rematch to get more experience and hopefully gain some confidence back. But we ran into the same problems as before and sadly, I never got to fight anyone before I left. Which of course leads me to where I am now, in the states working at the same Japanese restaurant that I worked at four years. Back when going to Japan was only just a dream. Ironic? It would seem so. I still see a lot of Japanese people and hear the language on a daily basis. I just can’t seem to escape Japan. As a prelude to my next blog, I’ll sum up by saying that I was scheduled to finish my school contract on March 25th 2011, and then I was going to hop on over to Australia for a working holiday year. But as everyone knows, March 11th came around and there was a huge earthquake and tsunami that rocked Japan, and I decided to leave early and come home instead. I am still planning on going to Australia later this year. And don’t count me out for kickboxing either. I may have had an unconventional experience in Japan, but I really do love training and want to continue with it wherever I end up. If, for whatever reason, I can’t fight in the states then I will keep training and try to fight when I go to Australia. Muay Thai is really popular out there, and I already have a specific gym picked out where I want to train. Previous Previous post: GTO: Gaijin Teacher OHMYGOD! Great series of blogs. From your writing I got the feeling it was like you said, nobody wanted to chance losing to a gaijin. If things do start back up in Australia, keep up updated! Thanks for reading. I will be trying to write more as I go! I fought plenty. You were the victim of home cooking and the ref was part of the ingredients. I’m with Chris. I was there, saw the fight, it was a very premature stoppage. Why would you say that? 65kilos is huge for a Japanese woman. She would be apportioned for that weight. Just look at the women who compete for Japan in judo. I think what she meant to say was how athletically built the girl looked. Just like a Judoka actually. What this all meant was that she had been training for a long time and was not inexperienced. It was clear to me personally that the girl was doing MMA. They kept this information from Le Tigre or her coach just didnt bother telling her. Another case of throwing the gaijin to the wolves. I know you don’t feel this way, but I’m still disappointed with your coach. I got pretty close to my coach during my hard times in Japan cause he helped me out in my personal life so much, so it was hard for me to see him doing anything shady towards me. But after being away and reflecting upon my experience….I’m starting to see your point of view. However, I still feel loyal to him. It seems something odd was going on with your time as a boxer in Japan. Although, fighting sports in Japan do have a `black eye` so to speak. It is hard for me to say for sure but they might have been using you a bit to make the Japanese fighters look good in front of the home crowd. Hell, who knows though. It can take a long time to get `on the inside` in Japan and get a fair shake. I say give it another go in Japan. We have a lot more coming from other fighters in Japan, MAJOR fighters that have fought the best, foreign guys, that tell a very similar story. Stand by.